Finally heard the mixtape andd Merms gives this five stars! 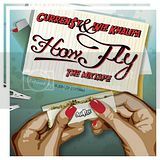 Didnt really like Curren$y but he kills the tracks on this mixtape. SO does Khalifa. Download it if you get the chance.